For other uses, see Lance (disambiguation). The lance is a pole weapon designed to be used by a mounted warrior or cavalry soldier (lancer). During the periods of classical and medieval warfare, it evolved into being the leading weapon in cavalry charges, and was unsuited for throwing or for repeated thrusting, unlike similar weapons of the javelin/pike family typically used by infantry. Lances were often equipped with a vamplate – a small circular plate to prevent the hand sliding up the shaft upon impact. Though best known as a military and sporting weapon carried by European knights, the use of lances was widespread throughout Asia, the Middle East, and North Africa wherever suitable mounts were available. As a secondary weapon, lancers of the medieval period also bore swords, axes, hammers, or maces for hand-to-hand combat, since the lance was often a one-use-per-engagement weapon; assuming the lance survived the initial impact intact, it was (depending on the lance) usually too long, heavy and slow to be effective against opponents in a melee. The name is derived from the word lancea - the Roman auxiliaries' javelin or throwing knife; although according to the OED, the word may be of Iberian origin. Also compare λόγχη (lónkhē), a Greek term for "spear" or "lance". A lance in the original sense is a light throwing spear, or javelin. The English verb to launch "fling, hurl, throw" is derived from the term (via Old French lancier), as well as the rarer or poetic to lance. The term from the 17th century came to refer specifically to spears not thrown, used for thrusting by heavy cavalry, and especially in jousting. A thrusting spear which is used by infantry is usually referred to as a pike. The Byzantine cavalry used lances (Kontos (weapon) or kontarion) almost exclusively, often in mixed lancer and mounted archer formations (cursores et defensores). The Byzantines used lance both overarm and underarm, couched (held horizontally). The best known usage of military lances was that of the full-gallop closed-ranks charge of a group of knights with underarm-couched lances, against lines of infantry, archery regiments, defensive embankments, and opposition cavalry. Two variants on the couched lance charge developed, the French method, en haie, with lancers in a double line and the German method, with lancers drawn up in a deeper formation which was often wedge-shaped. It is commonly believed that this became the dominant European cavalry tactic in the 11th century after the development of the cantled saddle and stirrups (the Great Stirrup Controversy), and of rowel spurs (which enabled better control of the mount). Cavalry thus outfitted and deployed had a tremendous collective force in their charge, and could shatter most contemporary infantry lines. Recent evidence has suggested, however, that the lance charge was effective without the benefit of stirrups. In Europe, a jousting lance was a variation of the knight's lance which was modified from its original war design. In jousting, the lance tips would usually be blunt, often spread out like a cup or furniture foot, to provide a wider impact surface designed to unseat the opposing rider without spearing him through. The centre of the shaft of such lances could be designed to be hollow, in order for it to break on impact, as a further safeguard against impalement. They were often at least 4m long, and had hand guards built into the lance, often tapering for a considerable portion of the weapon's length. These are the versions that can most often be seen at medieval reenactment festivals. In war, lances were much more like stout spears, long and balanced for one-handed use, and with sharpened tips. As a small unit that surrounded a knight when he went into battle during the 14th and 15th centuries, a lance might have consisted of one or two squires, the knight himself, one to three men-at-arms, and possibly an archer. Lances were often combined under the banner of a higher-ranking nobleman to form companies of knights that would act as an ad-hoc unit. The advent of wheellock technology spelled the end of the heavy knightly lance in Western Europe, with newer types of heavy cavalry such as reiters and cuirassiers spurning the old one-use weapon and increasingly supplanting the older gendarme type Medieval cavalry. While many Renaissance captains such as Sir Roger Williams continued to espouse the virtues of the lance, many such as François de la Noue openly encouraged its abandonment in the face of the pistol's greater armor piercing power, handiness and greater general utility. At the same time the adoption of pike and shot tactic by most infantry forces would neuter much of the power of the lancer's breakneck charge, making them a non-cost effective type of military unit due to their expensive horses in comparison to cuirassiers and reiters, who usually charging only at a trot could make do with lower quality mounts. After the success of pistol-armed Huguenot heavy horse against their Royalist counterparts during the French Wars of Religion, most Western European powers started rearming their lancers with pistols, initially as an adjunct weapon and eventually as a replacement, with the Spanish retaining the lance the longest. Only the Polish–Lithuanian Commonwealth with its far greater emphasis on cavalry warfare, large population of Szlachta nobility and general lower military technology level among its foes retained the lance to a large degree, with the famous winged Polish hussars having their glory period during the 16th and 17th century against a wide variety of enemy forces. The mounted lancer experienced a renaissance in the 18th and especially in the 19th century. This followed on the demise of the pike and of body armor during the 17th century, with the reintroduction of lances coming from Poland and Hungary. In both countries formations of lance-armed cavalry had been retained when they disappeared elsewhere in Europe. Lancers became especially prevalent during and after the Napoleonic Wars: a period when almost all the major European powers reintroduced the lance into their respective cavalry arsenals. Formations of uhlans and later other types of cavalry used 2-3 m (6.5-10 ft) lances as their main weapons. The lance was usually employed in initial charges in close formation, with sabers being used in the melee that followed. The Crimean War saw the use of the lance in the Charge of the Light Brigade. One of the four British regiments involved in the charge, plus the Russian Cossacks who counter-attacked, were armed with this weapon. After the Western introduction of the horse to the Native Americans, the Plains Indians also took up the lance, probably independently, as American cavalry of the time were sabre- and pistol-armed, firing forward at full gallop. The natural adaptation of the throwing spear to a stouter thrusting and charging spear appears to be an evolutionary trend in the military use of the horse. During the War of the Triple Alliance (1864–70), the Paraguayan cavalry made effective use of locally manufactured lances, both of conventional design and of an antique pattern used by gauchos for cattle herding. The Franco-Prussian War of 1870 saw the extensive deployment of cavalry armed with lances on both sides. While the opportunities for using this weapon effectively proved infrequent during the actual conflict, the entire cavalry (hussars, dragoons, cuirassiers and uhlans) of the Imperial German Army subsequently adopted the lance as a primary weapon in 1889. The German lance was made of tubular steel and, at 11 feet 9 inches (3.58 m), was the longest version then in use. The Austrian cavalry had included regiments armed with lances since 1784. In 1884 the lance ceased to be carried either as an active service or parade weapon. However the eleven Uhlan regiments continued in existence until 1918, armed with the standard cavalry sabre. During the Second Boer War, British troops successfully used the lance on one occasion - against retreating Boers at the Battle of Elandslaagte (21 October 1899). However, the Boers made effective use of trench warfare, field artillery and long-range rifles from the beginning of the war. The combined effect was devastating, so much of the British cavalry was deployed as mounted infantry, dismounting to fight on foot. For some years after the Boer War, the six British lancer regiments officially carried the lance only for parades. At the regimental level, training in the use of the lance continued, ostensibly to improve recruit riding skills. In 1908, the 9-foot-long (2.7 m) bamboo or ash weapon with a steel head, was reauthorized for general use on active service. 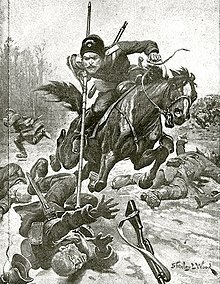 The Russian cavalry (except for the Cossacks) discarded the lance in the late 19th century, but in 1907, it was reissued for use by the front line of each squadron when charging in open formation. In its final form, the Russian lance was a long metal tube with a steel head and leather arm strap. It was intended as a shock weapon in the charge, to be dropped after impact and replaced by the sword for close combat in a melee. While demoralizing to an opponent, the lance was recognized as being an awkward encumbrance in forested regions. The relative value of the lance and the sword as a principal weapon for mounted troops was an issue of dispute in the years immediately preceding World War I. Opponents of the lance argued that the weapon was clumsy, conspicuous, easily deflected, and of no use at close quarters in a melee. Arguments favoring the retention of the lance focused on the impact on morale of having charging cavalry preceded by "a hedge of steel" and on the effectiveness of the weapon against fleeing opponents. Drawing from The War Illustrated representing a Russian Don Cossack lancing a German infantryman..
Russian "cavalry pike" (lance), type of 1910. Lances were still in use by the British, Indian, French, Russian, Belgian, Turkish, Italian, Spanish and German armies at the outbreak of World War I. In initial cavalry skirmishes in France this antique weapon proved ineffective, German uhlans being "hampered by their long lances and a good many threw them away". A major action involving repeated charges by four regiments of German cavalry, all armed with lances, at Halen on 12 August 1914 was unsuccessful. Amongst the Belgian defenders was one regiment of lancers who fought dismounted. With the advent of trench warfare, lances and the cavalry that carried them ceased to play a significant role. A Russian cavalry officer whose regiment carried lances throughout the war recorded only one instance where an opponent was killed by this weapon. The Greco-Turkish War of 1919-22 saw an unexpected revival of lances amongst the cavalry of the Turkish National Army. During the successful Turkish offensives of the final stages of the war across the open plains of Asia Minor, Turkish mounted troops armed with bamboo lances from Ottoman stocks inflicted heavy losses on the retreating Greek forces. Those armies which still retained lances as a service weapon at the end of World War I generally discarded them for all but ceremonial occasions during the 1920s. An exception was the Polish cavalry, which retained the lance until 1936, but contrary to popular legend did not make use of it in World War II. The Argentine cavalry was photographed carrying lances as late as the early 1940s but this appears to have been as part of recruit riding school training rather than serious preparation for active service. The United States Cavalry used a lance-like shaft as a flagstaff. When the Canadian North-West Mounted Police was established, it was modeled after certain British cavalry units that used lances. It made limited use of this weapon in small detachments during the 1870s, intended to impress indigenous peoples. The modern Royal Canadian Mounted Police, the North-West Mounted Police's descendant, employs ceremonial, though functional, lances made of male bamboo. They feature a crimped swallowtail pennant, red above and white below, symbolic of the long plain cloth that was wrapped just below the sharp metal tip for absorbing blood fluid to keep it from running down the shaft and making the lance slippery to hold on to and control. The New South Wales Mounted Police, based at Redfern Barracks, Sydney, Australia, carry a lance with a navy blue and white pennant on ceremonial occasions. "Lance" is also the name given by some anthropologists to the light flexible javelins (technically darts) thrown by atlatls (spear-throwing sticks), but these are usually called "atlatl javelins". Some were not much larger than arrows, and were typically feather-fletched like an arrow and unlike the vast majority of spears and javelins (one exception would be several instances of the many types of ballista bolt, a mechanically-thrown spear). ^ Ian Heath, page 33 "Armies of Feudal Europe 1066-1300", Wargames Research Group 1978"
^ "Saddle, Lance and Stirrup"
^ a b Frye, Gordon. "From Lance to Pistol: The Evolution of Mounted Soldiers from 1550 to 1600". myArmoury.com. Retrieved 21 July 2014. ^ Esposito, Gabriele. Armies of the War of the Triple Alliance 1864-70. pp. 33 & 44. ISBN 978-1-4728-0725-0. ^ Lucas, James. Fighting Troops of the Austro-Hungarian Army 1868-1914. p. 112. ISBN 0-946771-04-9. ^ A British officer writing in 1917 referred to lancers as "our marvellous medieval regiments"
^ Ross, David. The Royal Canadian Mounted Police 1873-1987. p. 24. ISBN -0-85045-834-X. Wikimedia Commons has media related to Lances. Look up lance in Wiktionary, the free dictionary.